“The foundation of billionaire industrialist Charles Koch is ramping up its ideological higher education donations, smashing last year’s record amount given to colleges and universities. The foundation, along with smaller contributions from two other Koch family foundations, gave over $51 million to higher education institutions in 2016, according to tax records analyzed by International Business Times. Koch donations typically come in the form of multi-year gifts, which support free-market centers [*], courses, professorships, graduate scholarships and lecture series, all with the aim of producing bright, young conservatives to recruit into their political network and like-minded professors to create scholarship that dovetails with the Kochs’ ideology and business interests. “Koch and his brother David are well known for running a giant oil, chemical and materials conglomerate, Koch Industries, and for leading a vast, conservative political network that rivals either of the two major political parties in size and funding. 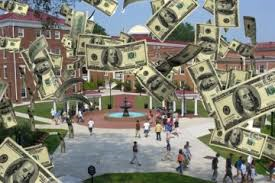 Lesser known, but crucial to their long-term strategy to bend America toward their small-government ideology, is their considerable funding of higher education. “In her most recent book, Dark Money, New Yorker staff writer Jane Mayer describes a 1976 New York City conference that Charles Koch organized for wealthy libertarians to plot a strategy to take over American politics. In order to broaden their radical conservative movement, Charles Koch advocated a focus on ‘attracting youth’ because ‘this is the group that is open to a radically different social philosophy.’ Koch’s political lieutenant at the time, former John Birch Society member George Pearson, said at the gathering that traditional university gifts would not be sufficient, but funding private institutes on campuses would make it easier for donors to exert more control over hiring decisions and the ideological bent of these centers. “The ‘Structure of Social Change,’ a plan devised by Koch and one of his closest lifelong associates, Richard Fink, begins with funding higher education. Next, academic output — or ‘intellectual raw materials’ — moves on to right-wing think tanks funded by Koch and his network, which repackage the scholarship into more relatable policy proposals. Koch-funded political advocacy groups then rally people around these policies and pressure lawmakers to adopt them. For the complete article, Charles Koch gave $50 million to higher ed in 2016. What did he buy? by Alex Kotch, click here. *For a Commentary on Global Free Market: a Perspective and Admonition, click here. This is really important. Thanks!